LOL. I was watching an episode of Aquateen the other night and couldn't help but notice they totally ripped like all the VCS Pacman sound effects off when doing the Mooninites. Four different levels. The bonuses are moving and fun to catch them. Worst Pac-Man game ever: jrPac-Man. - No tunnels to escape from ghosts. - Bonuses can destroy power pellets. Yuck! - If bonuses pass on the dots, the dots became bigger and slowdown the player. - Even Namco does not reconise this game. No kidding. It is "balls hard" without Turbo activated. Then when you use Turbo, it gets so fast in the latter stages I start making random errors while attempting to navigate the maze (I think my custom 8-way 7800 joystick is partly to blame,especially since you can confuse the game by hitting diagonals when rounding the corners). I like to use select button to start the level I left off on. With 5 lives + Turbo, I can typically make the last stage with the corner death traps after two or three games. Then I like to cool off with some Pac Collection set to Pac or Ms Pac with Plus mode and random mazes. Edited by stardust4ever, Thu Apr 9, 2015 7:00 PM. Wasn't Baby Pac some weird hybrid between Pinball and Video Arcade? Yes, indeed it is. Back in the day, we had one by our local Nathan's. I probably played it a dozen or so times and now still can somewhat/loosely experience it via Visual Pinball/PinMAME. While the live experience is cool (Hey, it's Pinball and Pac-Man...what's not to love? ), truthfully, at least for me, both the Pinball and Video games are below average. 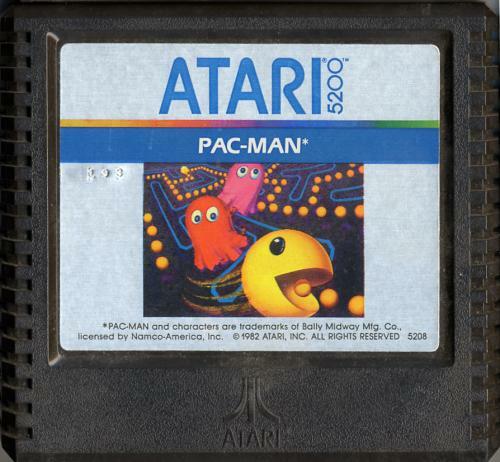 Absolutely, the cool factor is there, and it's pretty wild when the game switches between the two; however, if they were separated and just experienced individually, Baby Pac-Man the stand-alone arcade game, and Baby Pac-Man the stand-alone pinball game, the feeling would likely be unsatisfying and disappointing. Looks like Ms.Pac-Man on Atari Lynx when the player gets a lightingbolt and runs very fast. Pac Man. The original arcade. The one that started it all. My favorite Pac-man is what us kids called "Chinese Pac-man". I think it's actually an unlicensed hack, titled "Hangly-man". Anyway, the maze flashes and disappears all-together, under different conditions. It was an awesome "sequel" of the original, back-in-the-day. Edited by AtariKid81, Tue Jul 21, 2015 2:34 PM. I like Jr. Pac-Man with the hack that puts a tunnel in the maze! Ms. Pac-Man. If I'm in the mood for a game, I usually reach for the VCS version. The VCS version of Ms. Pacman because it still evokes a strong reaction in me. Else, of course the arcade game of Ms. Pac although I prefer the challenge of the speed-up hack... which actually gets very challenging when you get to the point the ghosts don't turn blue. 5000 pt bananas aren't guaranteed so my ceiling on that game tends to be in the 300-400k range. Edited by NE146, Tue Mar 29, 2016 1:57 PM. Ms. Pac Man is in my top 5 games of all time, and that got my vote. I tend to play the 2600 or arcade version, but there are lots of other good ports of it. I always liked it better than any other Pac Man, but I've started to appreciate the original more as time goes on and I probably play that more often these days (A8 and 5200 versions, mostly). Edited by BydoEmpire, Tue Mar 29, 2016 4:55 PM. This, all day long. Ms Pacman, random mazes. Plus mode depending on if I'm in the mood. I went for Ms. Pac-Man. The arcade version is my favorite, and I play it at home on my multicade just about every week, but I also really like the Game Boy Color port. Ms. Pac-Man: Special Color Edition plays a tiny bit slower and is a touch easier than the arcade version, making it a very relaxing experience to play for someone who is used to the arcade original. It also looks nice in full screen mode and it's easy to tell what/where everything is on the screen. so count me as "other"
Pac-man 256 is probably the best I've seen. it's for Android and IOS. It has an endless maze, lots of ghosts and all kinds of crazy power ups. Pac-mania for either NES or Sega would be my runner-up, followed by Ms. pac-man for the 2600. I'll go with Ms Pac-man because of the variety in mazes and moving fruit without the difficulty of the (still excellent) Jr Pac-man. The A8bit versions are my favorites. The colors look really nice and bright and the sound effects don't grate on my nerves. For some inexplicable reason, I have this burning desire to play a Ms Pacman coctail cab with a set of Ms Pac Attack EPROMs installed. 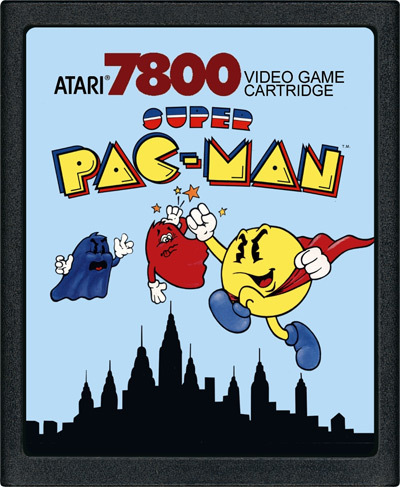 You can find this mode on the 7800 Pacman Collection but I wish I could find a v0.37b5 compatible MAME ROM for for my Raspberry Pi cab. It's a fun little variation that is challenging like the original and a nice remix without being stupid hard. "Strange" Maze variation on Tengen Ms Pacman for the NES or Genesis is another good one, but not quite as fun as the Ms Pac Attack arcade hack. I love the arcade version of Pac-Man the most, but I like all the console versions as well, as well as the collections for GameBoyAdvance. My favorite console version is the 5200. It has the intermissions and plays a lot like the arcade. 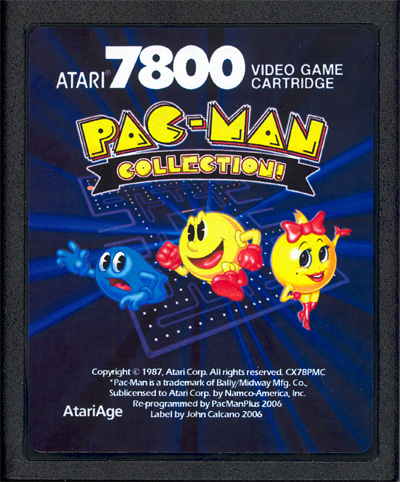 Of course, the 7800 Pac-Man Collection also rocks. 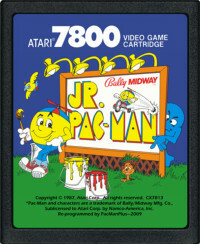 And Nukey Shay's 2600 Pac-Man 8k rocks.